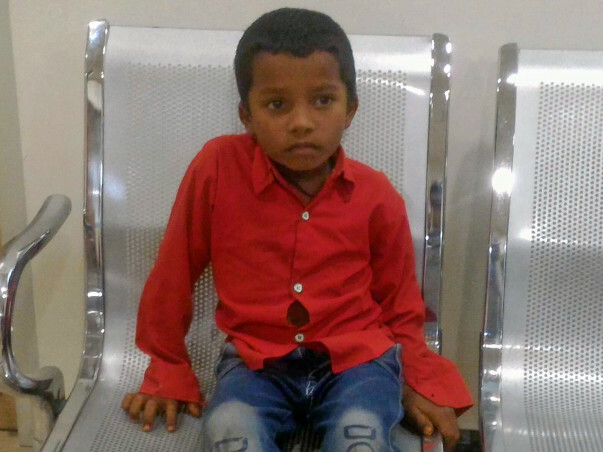 5-year-old Suhail was brought to Manipal hospital with complaints of deformity of the back, back pain. Doctors diagnosed that he is suffering from a deformity since birth and this has caused a significant functional disability as he grew. He has been diagnosed with Congenital Thoracolumbar Kyphoscoliosis of over 90 degrees and has been advised Posterior Spinal Closing Opening wedge Osteotomy surgery for the same at the earliest. The approximate charges of this surgery is Rs. 6,00,000/- including the Imported Titanium Implants. Suhail has 4 elder brothers and 2 sisters. His father and mother are from an underprivileged background. His elder brothers work in the market as daily wage workers and their total family income is just Rs. 6000 to 7000 per month. They live in a rented house and pay a rent of Rs.2000. His other siblings go to the government school. The family is finding it difficult to cover the treatment expenses. He has high chances of recovery and is a very active child. He needs to visit the hospital regularly for checkups. I am Sudhakar, a Milaap Open fellow in Bangalore. I spoke to Suhail’s father, Bahadur Ullah Shah, on 22nd July. 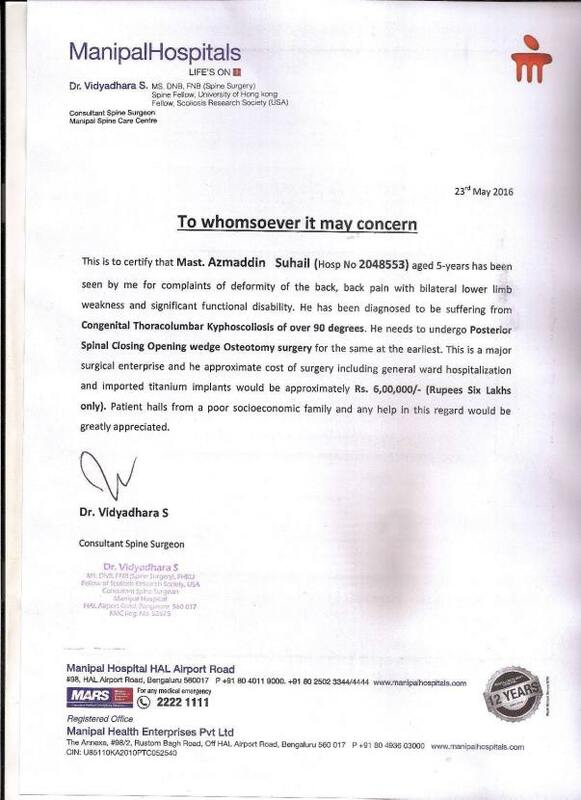 Suhail’s surgery was successful and he got discharged from the hospital in the second week of June. He has been advised not to take up any strenuous activity for 15 days post discharge from the hospital. He has recovered fast after the surgery. Suhail has joined school in the 1st standard this month. The doctor has advised a routine check up for Suhail every month at Manipal Hospital. Funds from Baby-of-Shilpa's campaign. Get well soon Suhail.